Quartz crystals heal, cleanse, balance and strengthen, resulting in physical, mental and emotional well-being. All of that and beautiful, too!! 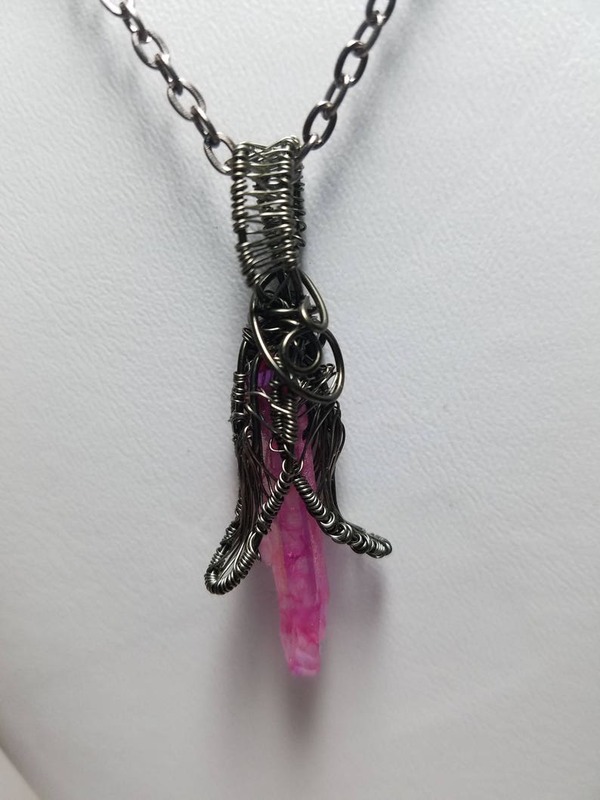 I wrap my crystals in high quality tarnish resistant fine silver clad or color coated copper wire. (NOT craft store wire!!) These are natural gemstones and raw quartz crystal points which have been bonded with various minerals & metallic salts (to produce the different colors) and drilled. Each crystal is unique and yours may differ slightly from the one that is shown--but it will be just as lovely. * Pendants is 2 inches long. Convo me if you are interested in a custom made necklace for yourself or someone special or if I happen to be sold out of the color you want! Very cute! If u make another one, i will surely buy it! Perfect handmade! Beautiful bracelet and perfect for summer. Very delicate and intricately wrapped stone. Very fast shipping and the item was securely boxed. The color of the crystal is BEAUTIFUL and the intricate wire pattern encasing the crystal itself is something that I've never seen and it's absolutely FANTASTIC ! Also, the length of the necklace "24" is perfect for me. I'm 110% happy and satisfied with this item and I'll definitely be a returning customer in the very near future 😊. Payment is by Paypal or Etsy Payments. Anything shipped to Pennsylvania will be subject to 6% sales tax. Window Shopping on the internet can be expensive--the shopper would be required to pay shipping in both directions and it is really not recommended. Therefore, all sales are considered final so we would ask that you be certain of what you are ordering before purchasing by asking any pertinent questions and perhaps requesting additional pictures. We are more than happy to help with your concerns. If there is a problem with any purchase, please contact us immediately so we can rectify the situation. Shipping damages are resolved by filing a claim with the carrier--not by returning the item. Most items are shipped via USPS. Check the listing to see whether by priority or first class. Custom orders are welcome--please contact us with your ideas. Wholesale inquiries are welcome--but a tax number will be required. Wholesale discounts are not available for small orders of 1-4 pieces.